I've got good news. We've got somebody working on it. I don't know when it will be finished, but at least someone is assigned to the task. I did a quick fix. It can be found in the freebie section of my homepage, link is in my signature. You´ll need rtencoder to decode it www.rtencoder.com. It´s a stand alone product. None of your original data will be overwritten. Thanks for pointing out these videos! Did they ever fix the UV situation on the basic suit? Not yet... but there was an update that someone was assigned to it. Please pardon my naiveté. 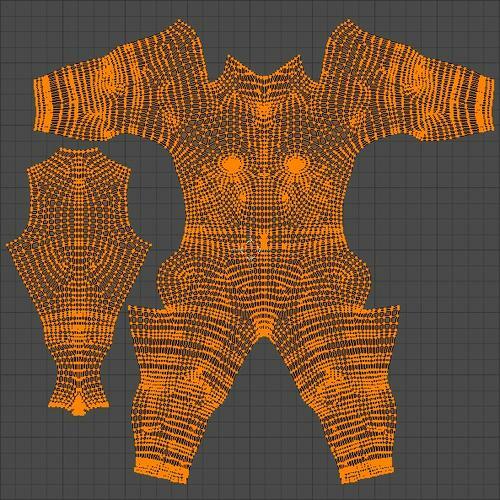 I watched the basic suit video, and I see that some of the garment parts overlap on the UV map. Can someone explain the problem that this causes? Does it prevent people from applying separate shaders to the surfaces that have overlapping areas on the UV? Anything that appears on the overlapping areas of a single material zone will appear on both front and back, making it hard to place symbols or to have things join up between front and back. If the areas did not overlap, or if they are separate materials and so able to take separate textures (which is Randy's work-around) then that problem goes away. You need to create templates from the modified item, which means exporting as OBJ, opening in UV Mapper Classic, and turning off the overlapping materials (select them from the Edit menu, then I think it's the ' key to hide them) - you should be able to see several materials at once on a single template, you don't need a separate image for each, but there will be several images in all. Thank you Richard! I managed to save templates for the Torso Front and Torso Back. Then I created a texture for each in Photoshop. I applied each one successfully to the corresponding surfaces of my modified Basic Suit. Now I will try to do the same with the fixed shorts. I love to learn new things! Thanks again for the instructions. I can't believe this has not been fixed yet. The Basic Suit could be such a versatile item that many artists could be creating textures for if not for this glitch. It only took a few minutes for me to fix it after watching the 15 minute video by Randall Lloyd (link below) and I was not even familiar with the process. Maybe they are working on something more elegant but still a major UV glitch never should have made it passed the testing phase or should have at least been fixed within a week or 2 after it was reported. I would think the loss to reputation would be far more costly then the resources needed to fix it. Sure we could just use the quick fix but an official fix would be much better for consistency and would encourage more people to create textures for it. Fixing problems doesn't make you a bucket of money instantly. Thus it isn't interesting for DAZ. And I doubt they care much about their reputation in that regard at this point. You may very well be correct but I would think in the long run they would lose more money then saved through lost sales & customers by not fixing it. It could be that spending that time on new items brings in more though. But they could even just allow a user fix. The only logical thing I can think of is they are making more advanced updates to it and wanted to do it all together & that is taking longer than expected. Some communication would really help but I don't think we heard anything other than it's assigned? I'd love to know what type of fix they are going to apply, if any. Like if they go with the fix from the video we could start working on textures now. Maybe they don't even know what they are going to do with it. There is a big expansion being worked on so it should be getting some attention soon. Some may consider making new original UVs but I would hate to spend time doing that if they make a universal fix. Yes please fix it. Daz has such a high standard of quality most of the time to allow an item as big and well as awesome as the Supersuit to go unfixed I would think would be beneath Daz. I am keeping the hands and feet unattached, I feel it causes less distortion. I also detached the back like in the original mappings, makes it easier to add emblem or whatever, but everything will be on one map. Once I get it flattened I can always add more seams for dividing. Feed back on how people would like it laid out is welcomed, but I am a slow cranky old fart so you may get what you get. I think I have a way to distribute the new mapping without distributing the mesh but it will require either Blender or UVMapper Classic. And I have to find the thread that explained adding alternate UVs using Studio. I finished the mapping a few days ago. To get the hands to map well I had to separate the upper and lower sides. 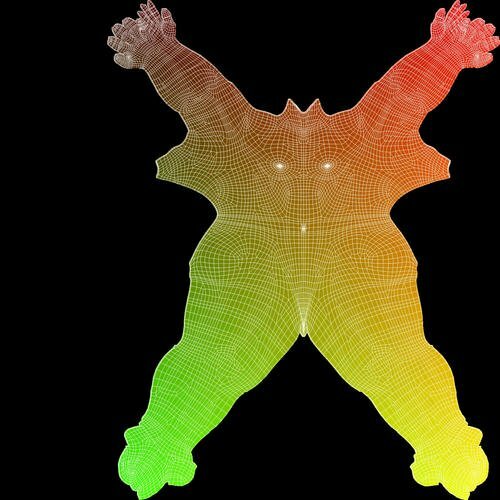 Just tested the distribution method using UV Mapper Classic and a .uvs file and worked flawlessly. Now I just have to get confirmation for DAZ distributing the .uvs file doesn't violate copyright. If you create the UVs from scratch you don't need permission, but if you modify their UVs (dragging them around/repositioning etc) then you do need permission - a UV set is a sellable thing, even though it's not a mesh. I find it incredible that we are all still fighting with this. 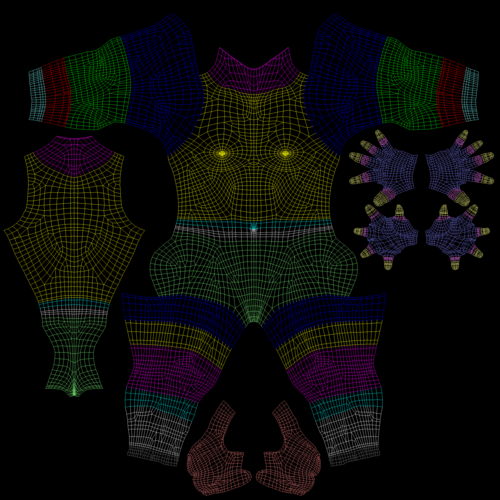 If I sold something as elaborate as the SuperSuit and the users couldn't make their own textures because of my UV work, I wouldn't be able to sleep until I corrected it. "Thank-you" to everyone who is trying to do the work and share it with the rest of us.